Premature arrival at one’s destination is a condition that generally afflicts young, inexperienced plant hunters but it can strike in middle age too. Impatience, contrary to received wisdom, is often a virtue but occasionally results in frustration, at least for one party. Galanthus transcaucasicus, the species that ignited the train of thought which led to the snowdropathon, is one of those that that has both winter and spring-flowering populations. A particular cultivar deriving from Iran, G. transcaucasicus ‘November Snow’, is named for its habit of flowering, in cultivation in the UK, in the eponymous month. I hadn’t managed to procure an exact location for the wild origin of this early-flowering population but had decided that, if I drove around the Alborz Mountains near the Caspian Sea, I’d run into flowering snowdrops. How hard could it be? 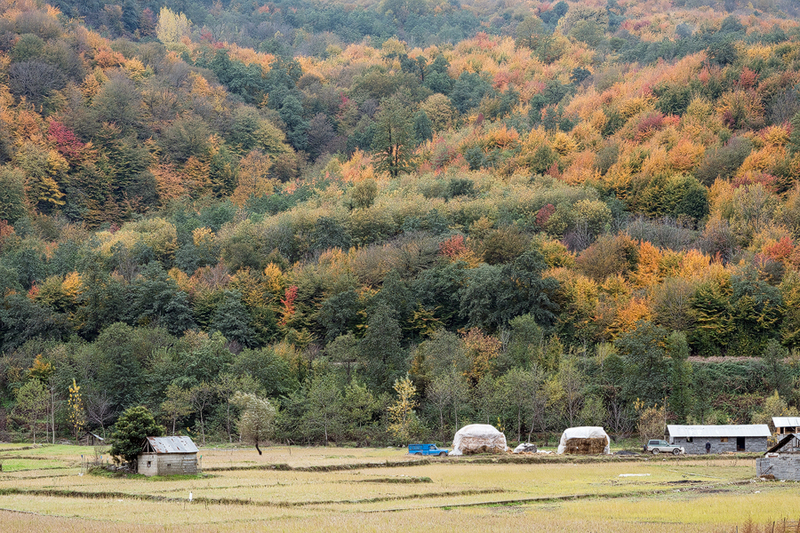 Hyrcanian forest in the western Alborz Mountains, Iran, 16/11/2015. 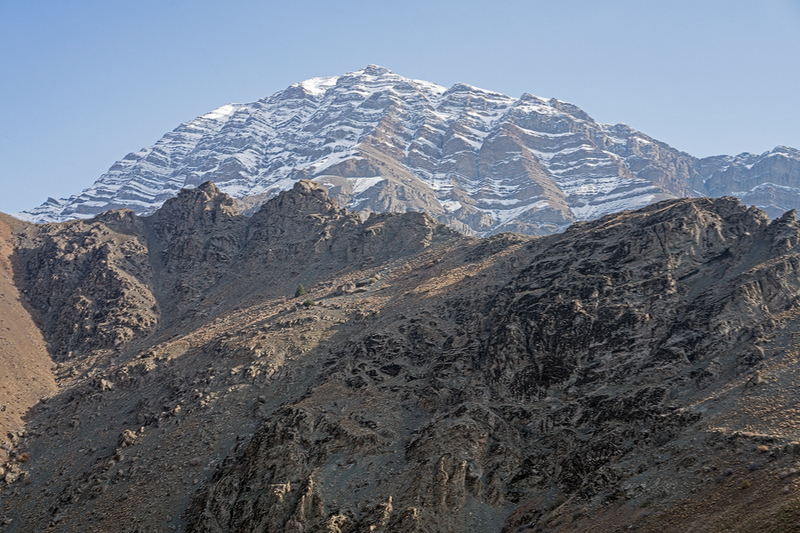 Driving around the Alborz Mountains is easy but the process of securing a visa to enter the Islamic Republic of Iran is laborious and involves sending your passport to Frankfurt, the nearest visa-issuing Iranian embassy to the UK. Although I greatly prefer travelling alone and driving myself, I discovered that, even with a valid visa, British and American citizens must be accompanied in Iran by a certified tour guide and so, reluctantly, I engaged, via a specialist travel agency in the UK, the services of an English-speaking Iranian driver and guide and arranged a provisional itinerary, taking in the SE Caspian coast, based on guesswork and naïve optimism. As soon as I met him, I knew that Mostafa Selahi would be my kind of guide. He appeared to be about 90 years old, thin, small and wiry, with close-cropped white hair and an unkempt moustache, stained with tobacco. His face, as brown and wrinkled as a walnut, spoke eloquently of a life full of loving and laughter. His voice, when he spoke, was musical. ‘Haaaf yoooou Iraaaaanian moooneeey?’ he asked, drawing out every syllable as though uttering his dying words, seeming to imbue each one with more meaning than it could possibly semantically support. I confessed that I was deficient in the Iranian currency department and so Mostafa led me to the bank upstairs, insisting on carrying my camera gear, which roughly doubled his weight, bowing him into a human walking stick. Iranian money obtained (I became an instant Rial multi-millionaire), I was introduced to Mostafa’s eccentric driving style when, having missed an exit near Tehran airport, he tried to make a U-turn on the motorway and drive the wrong way up a slip road, wisely aborting the attempt only when an approaching cement truck showed absolutely no signs of wanting to play ‘chicken’. I briefly regretted my commitment to atheism. 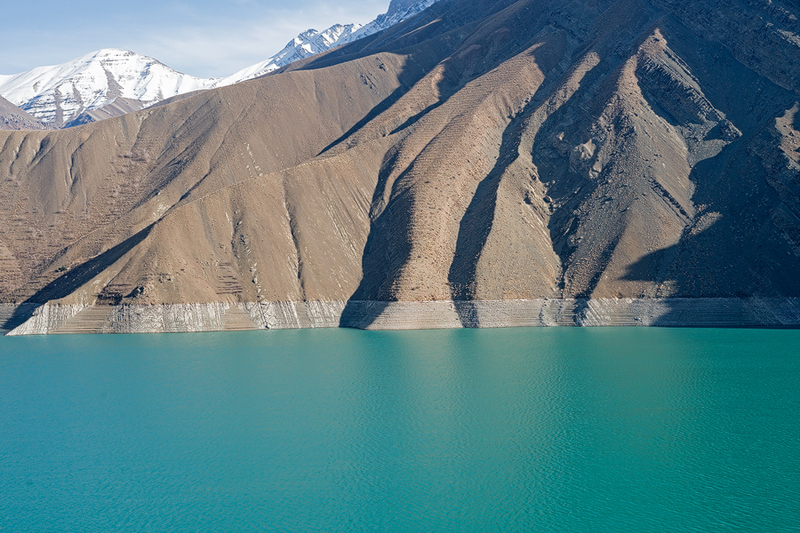 The reservoir that supplies much of Tehran’s water. Western Alborz, 16/11/15. Not far north of Tehran, in the foothills of the Alborz, we pulled over by a waiting car and met Mostafa’s wife Nayer and their son. Nayer joined us for the remainder of the trip, which turned out to be a great boon, for she spoke excellent English and proved to be a deeply knowledgeable and enthusiastic guide to Iran, with a dry sense of humour that chimed with my own. 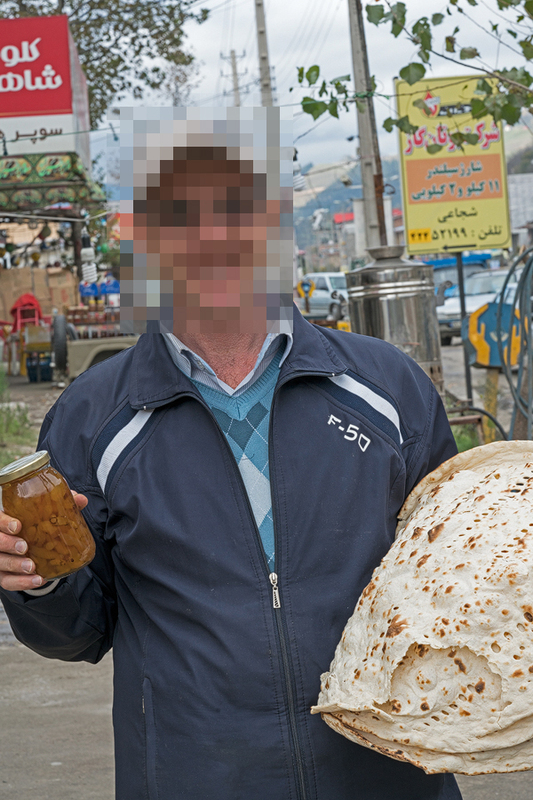 Nayer had brought soup and sangak, the first of several species of Persian flatbread I was to taste. Mostapha heated the soup on a gas ring in the back of the Nissan truck and we ate it from enamel plates with handfuls of vibrant green herbs and peppery onions, feeding the scraps to a lactating, stray dog and her litter of pups. The Alborz Mountains are clearly visible from Tehran, a city of 13 million residents, swelling to perhaps 18 million during the working day. The peaks, snow-capped at this time of year, rise above the pall of smog that hangs permanently over the city. 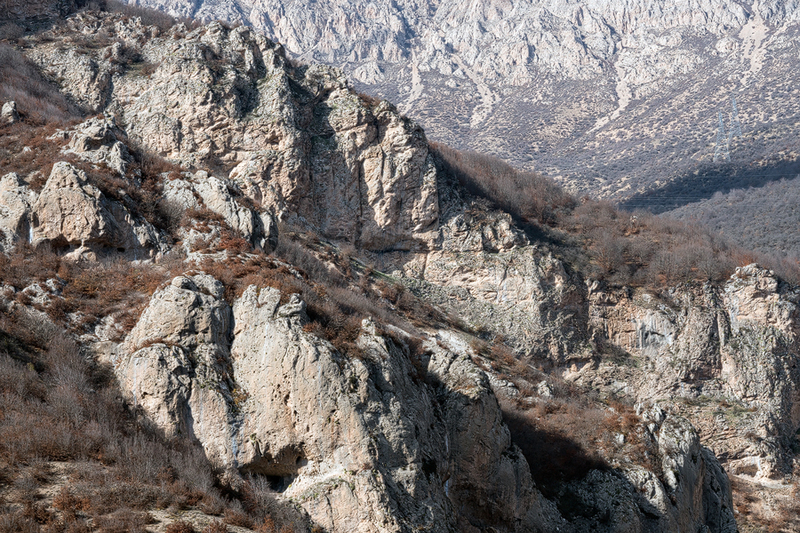 We took the Western route to Chalus, on the Caspian Sea, rising through an arid, treeless landscape, on a road blasted by German engineers, in the days of the last Shah’s father, through the deformed limestones and igneous rocks of this geologically active region. Passing through a new tunnel near the pass over which the old road clambers, we started to descend and the vegetation changed abruptly, to a scrub of beech, hawthorn, rose and Berberis. 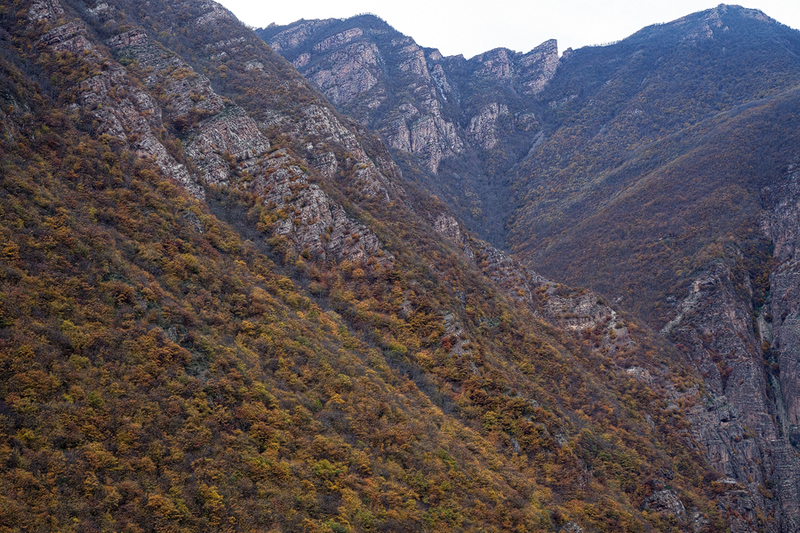 At this elevation – about 2,400m – the trees were already bare but, as we descended into a deep river valley, the Hyrcanian forest of the Caspian-facing elevations of the Alborz started to appear, still clothed in autumn finery. 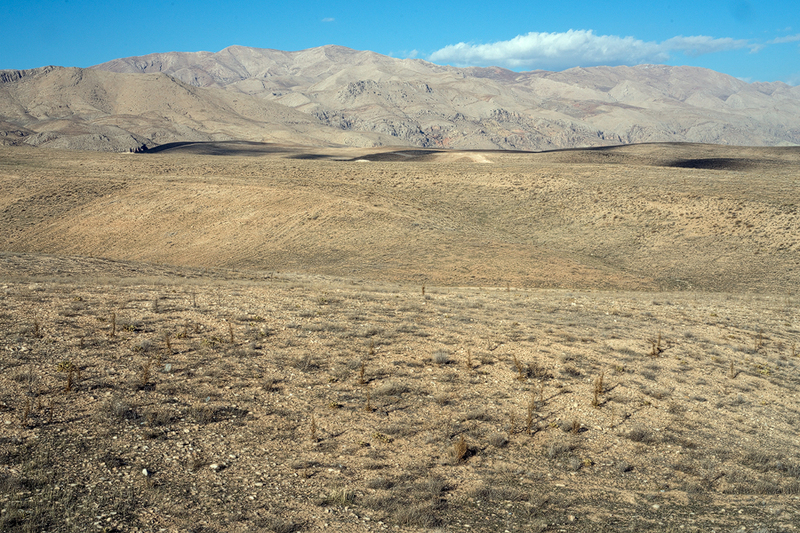 The arid, south-facing elevation of the western Alborz, 16/11/2015. A waterfall tumbled down an east-facing slope, through blazing woodland. ‘Beeeyoootiful auuutumn colooorrrrr!’, remarked Mostapha redundantly, indicating simultaneously with hand and steering wheel, bringing us perilously close to the adjacent precipice, and rolling his ‘r’s, in a way that made me understand why Nayer had fallen for him. 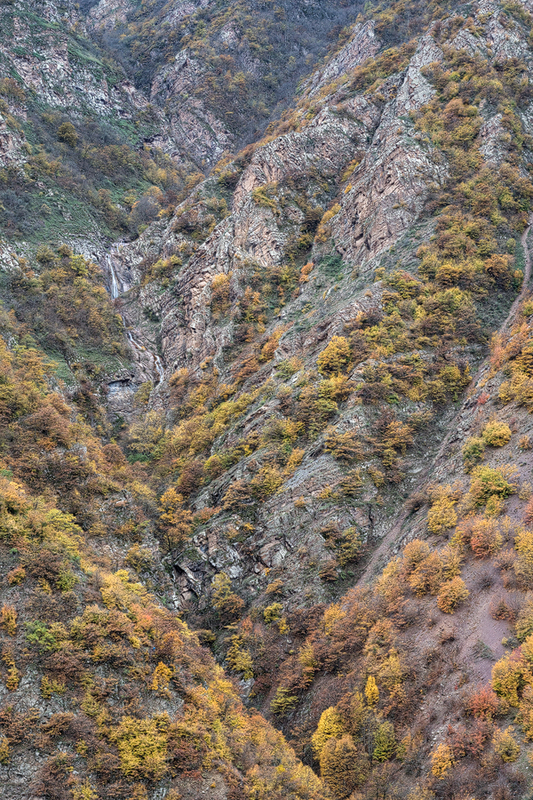 Hyrcanian forest, Western Alborz, 16/11/2015. I had been corresponding with an Iranian plant enthusiast and we had arranged to meet at our hotel near Chalus, early the following morning. The absurd realities – for now – of political life in Iran mean that I cannot use this remarkable, gracious and generous man’s real name, nor show his picture, for fear that his employers would disapprove of his unauthorised association with corrupting foreigners. I shall call him Ismael. Bleary-eyed, I opened the door to Ismael, who had set off from his distant home at four o’clock that morning. We exchanged gifts, his far more generous than mine, and we set about discussing my devout wish to see snowdrops in flower. ‘It is too early,’ he said, gently but bluntly. But I refused to believe this. 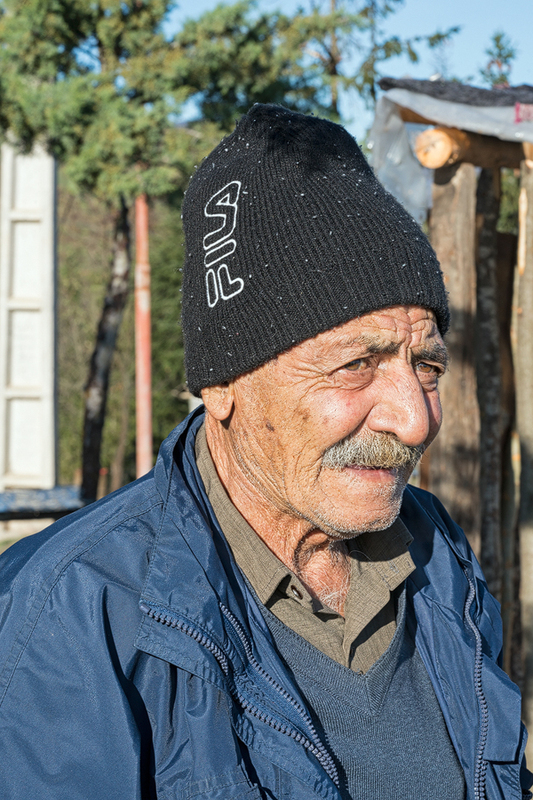 ‘Perhaps we can find a population near the sea, which is already flowering?’ ‘We can try, near Behshahr,’ offered Ismael. And so we went to Behshahr. But, as we checked out of the hotel, he pointed to a bank covered with flowering Cyclamen and Crocus. ‘Are you interested in these plants too?’ he enquired. The wonderful thing about having a consuming interest in plants is that almost wherever in the world you go, there is something fascinating to see. I had come to Iran to look for snowdrops and – as you have already divined – I failed dismally in this primary objective, but here was a wonderful consolation prize. 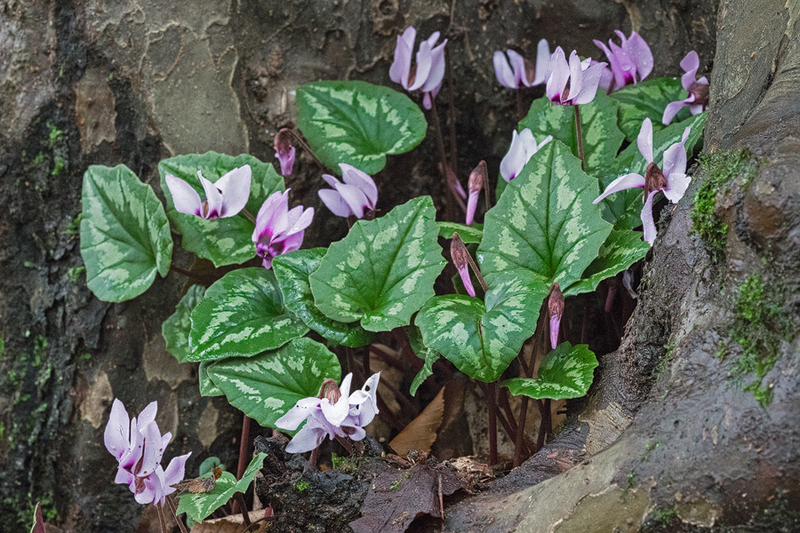 The Cyclamen was C. elegans, a species poorly known in cultivation, endemic to the Hyrcanian forests of the southern Caspian coast. 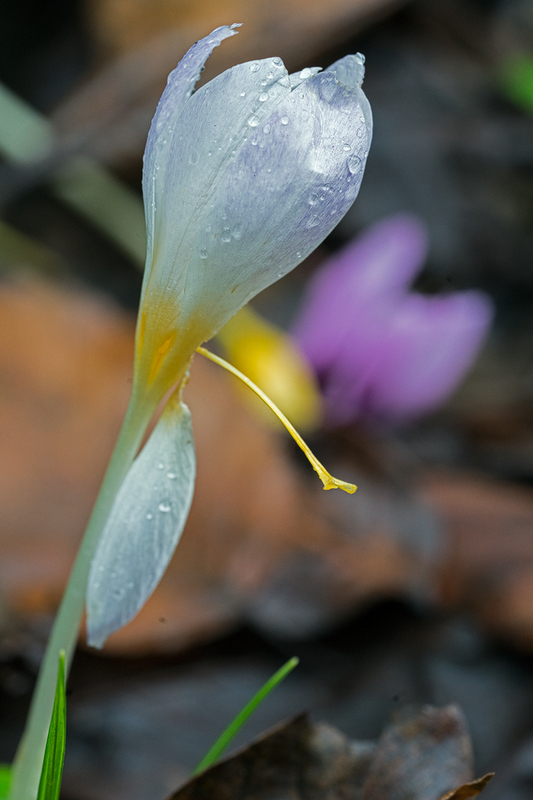 The Crocus was another endemic, C. caspius. 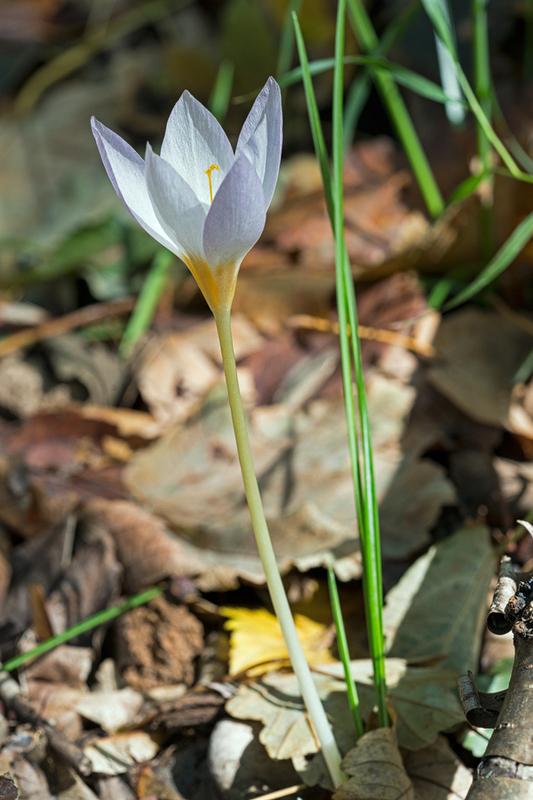 Both were flowering in the mild, snow-free autumn of these low elevation woodlands, just as several Crocus and Cyclamen species do in the equally benign climate of southern Greece. 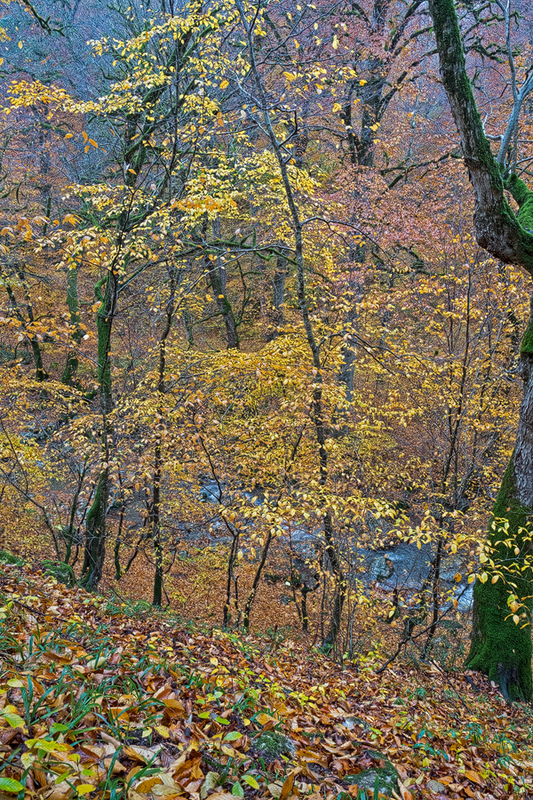 A bank under mixed woodland of Fagus, Parrotia and Quercus. 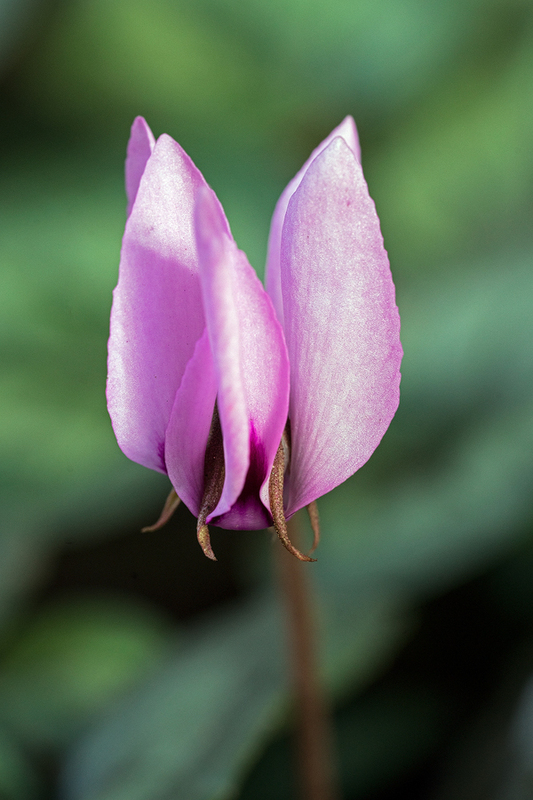 The Cyclamen is an early flowering population of C. elegans, with Crocus caspius flowering in the background. The elevation is about 150m. Near Chalus, Caspian coast, 17/11/15. 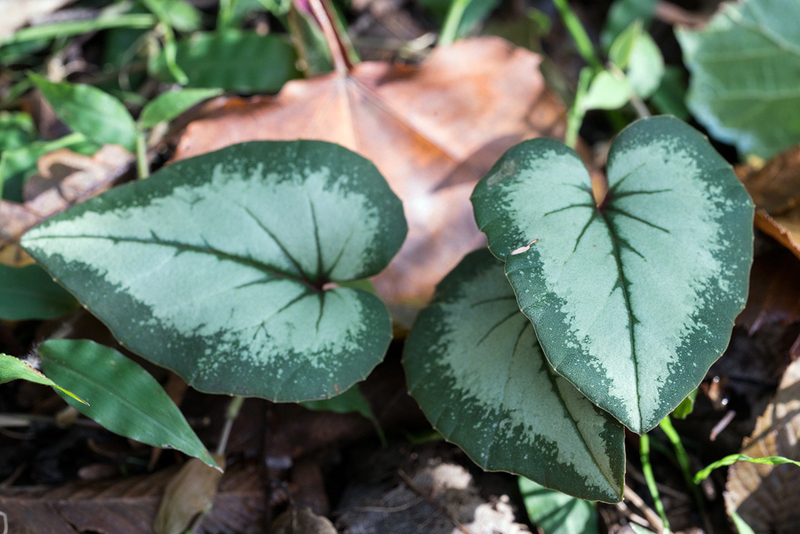 The Cyclamen had heart-shaped leaves, with a scalloped margin and a variable, shield-like silver mark on the upper surface. The pink flowers, typically for the genus, were propeller-shaped, with pointed petals and prominent, protruding sepals, with a deep purple stain above the point where the petals reflex. One could – as some have – make a lifetime’s study of the variation in this extraordinary group of plants. 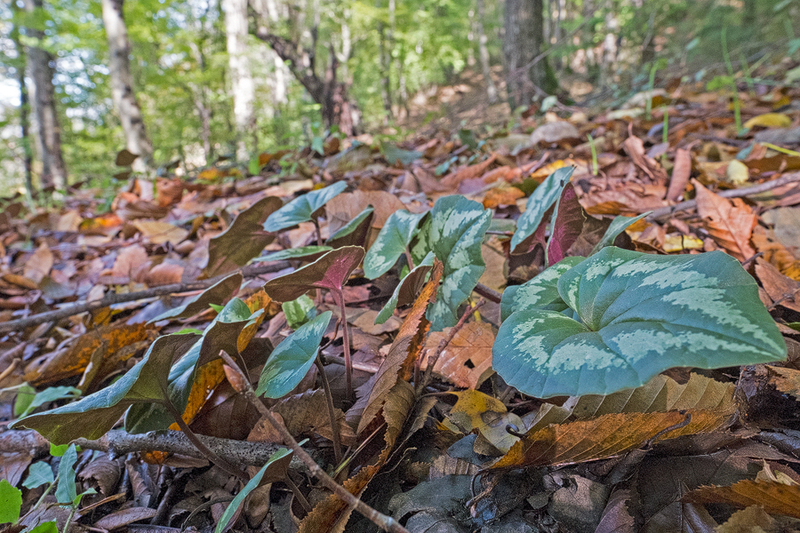 Cyclamen elegans, south of Sari, Iran, 19/11/2015. Cyclamen elegans, Chalus, Caspian Sea, 17/11/15. 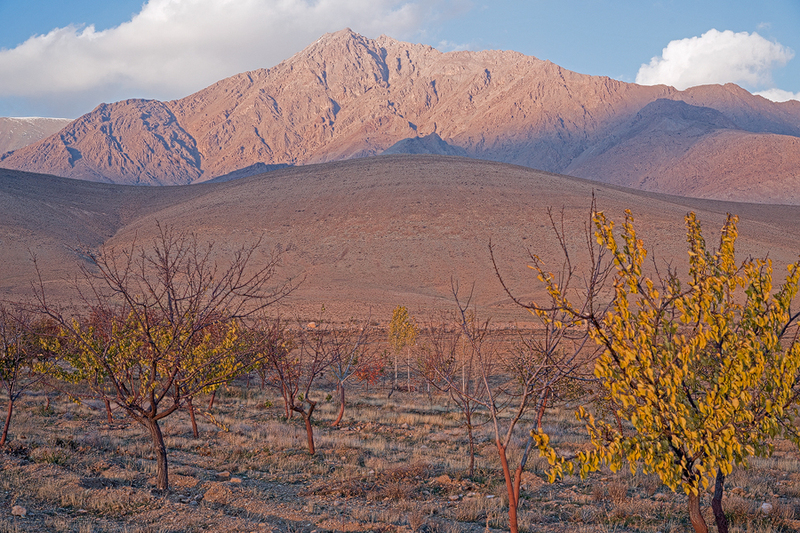 Although northern Iran is deeply etched on the plant hunter’s must-visit map, most Western pilgrims come in spring. My Iranian guides were visibly puzzled by why this stupid Englishman had come to see flowers in November. ‘Eyeee theeeenk yoooou hafff commmm to seeee Colchicummmm,’ suggested Mostafa, after much contemplation, positing the first of several incorrect conspiracy theories about the real reason for my visit. I certainly saw few plant species in flower during my few days in Iran but I’d have made the trip just for the privilege of seeing the delicious Crocus caspius in flower, in the wild, with my own eyes. Crocus caspius, Chalus, Caspian Sea, 17/11/15. The entire Caspian coast – at least the flat, two-hundred-kilometre-long stretch of it that I saw – has been utterly destroyed by a ribbon of heart-breakingly ugly development, which is ongoing. It took us most of the day to reach Behshahr, with regular stops to brew tea and rearrange by phone our hotel for the night. It is beyond my powers of description to paint a portrait of Mostafa, as he tried to explain to the travel agency in Tehran that, not only was this Englishman determined to find flowers in November, he wanted to look for them somewhere not on the original itinerary. This was unprecedented stuff and I suspect that I am responsible for a substantial increase in Mostafa’s cigarette habit. 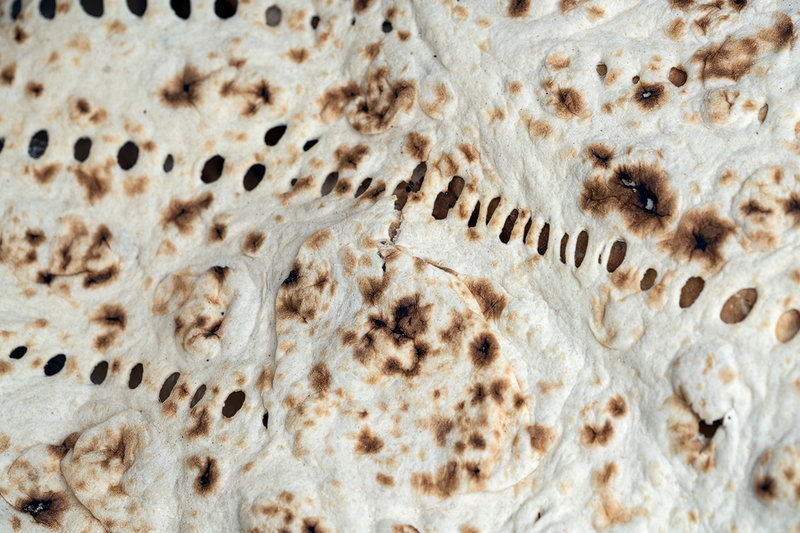 The delicious Persian flatbread, taftoon. In the last hour of the day, in light drizzle and failing light, we drove up into the glorious, still intact forest, looking in vain for Galanthus. At lower elevations the forest had been displaced by wheat fields and great chunks had been gouged out of hillsides to procure clay for the making of ceramics. 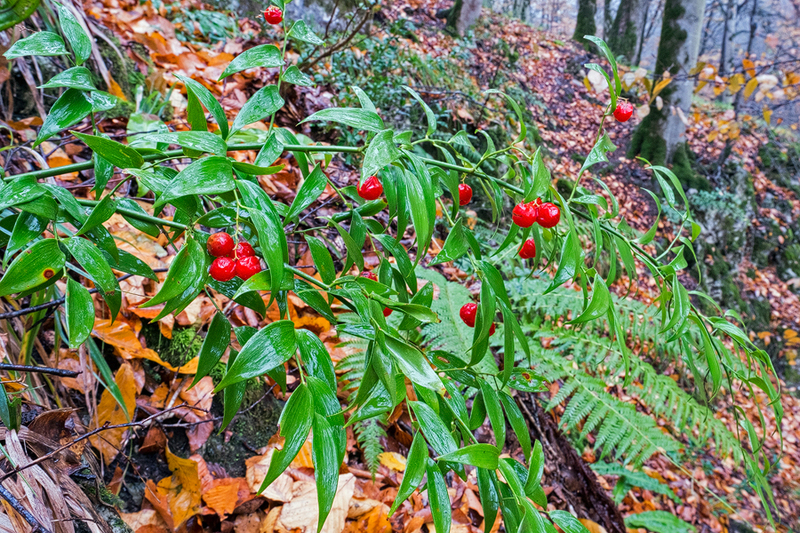 Higher up, in woodland dominated by beech, we found an understorey of Ruscus hyrcanus, which is distinct in its arching habit from R. aculeatus, which is ubiquitous around the Mediterranean. 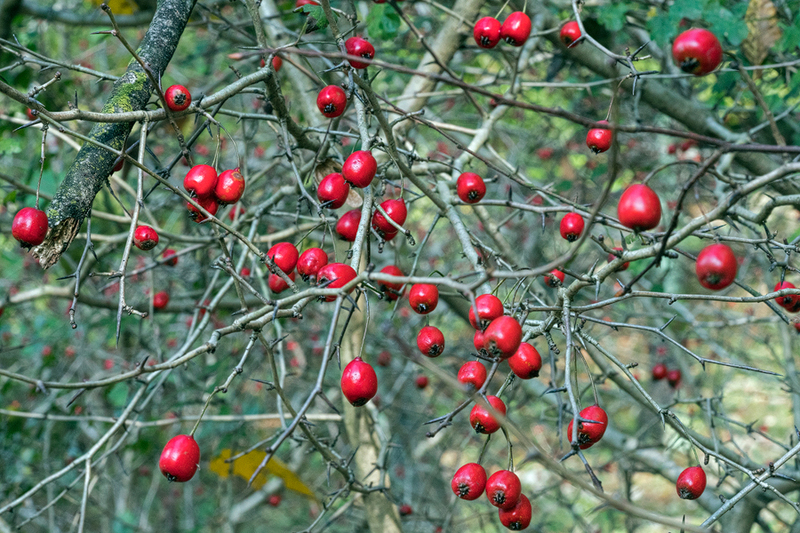 A few plants were festooned with bright red berries. 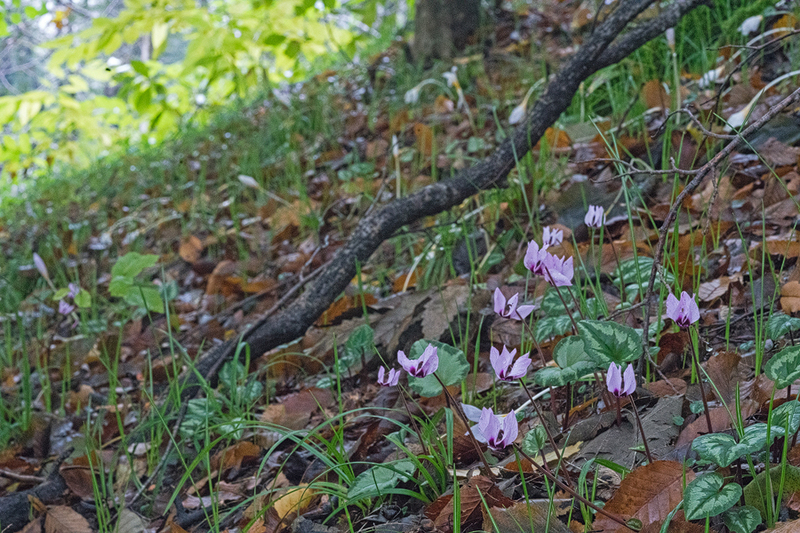 Cyclamen elegans was abundant everywhere but was not flowering, at these higher elevations. According to the books, it flowers in late winter and early spring. 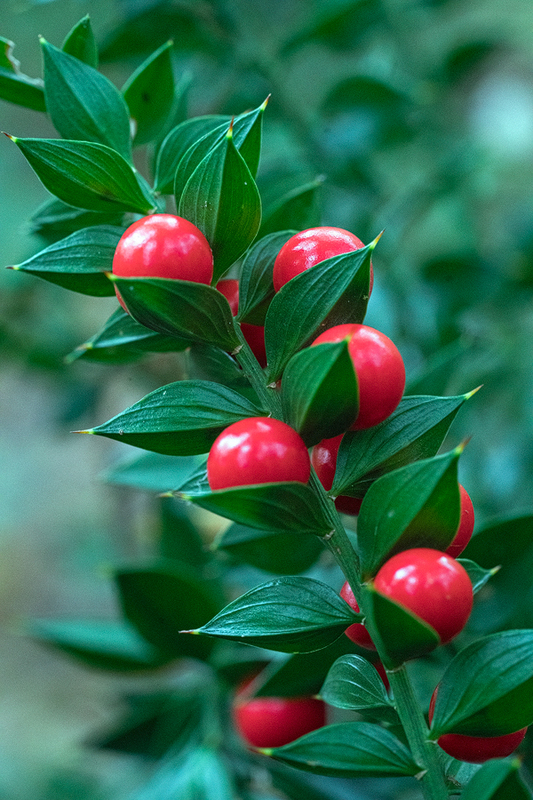 Ruscus hyrcanus. Alborz, 550m, 17/11/2015. That evening we dined in the excellent hotel restaurant. ‘What would you like to eat?’ asked Nayer. ‘Something new and interesting,’ I replied. ‘Ah, we have lots of new and interesting!’ piped up the manager of the restaurant, who had been hovering at our table. She walked me through the choices. 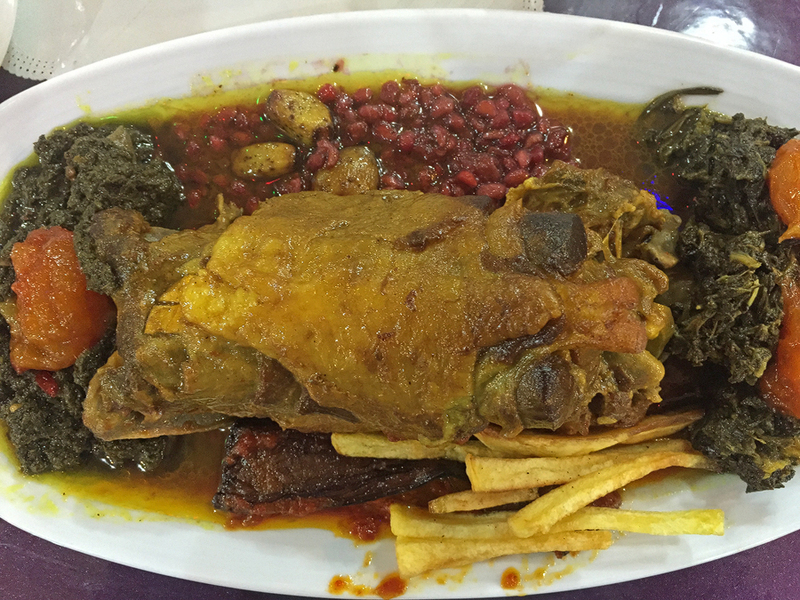 I wanted to try everything but settled for mutton. It came – an entire neck, complete with about a yard of spinal cord – with a mountain of rice, spinach cooked with sour plums and a heap of glistening pomegranate seeds. And more bread, this time lavash, a wafer-thin flatbread that I didn’t rate. While I slept in a pharmaceutically-aided trance Ismael, who was sharing my room, lay awake, listening to the soothing sound of my interminable snoring (I did warn him). In the morning, we debated our plan of attack for the day. I was convinced that, if Cyclamen and Crocus were already flowering at low elevations, Galanthus would be too. But populations of Galanthus are always less frequent than the other two genera and finding them would mean systematically searching every small road leading up into the hills. Try as I might, I could not explain that this was what I wanted to do. Ismael wanted instead to show me a high elevation road where, he assured me, we would see interesting plants and, slightly grumpily, I acceded to this suggestion. ‘Arrrrrrrr yoooou happeeeee?’ asked Mostapha, sensing my mood, as we sat in traffic in the centre of Sari, the capital of this province. I replied, as diplomatically as I could, that I preferred forests to cities and was looking forward to getting up into the hills. Soon we were ascending a river valley, the narrow floodplain parcelled into mud-walled rice paddies and my spirits lifted with the elevation. Spectacular, multi-coloured woodlands clothed the steep hillsides above the cultivated, flat valley bottom. We stopped for tea, at a roadside café at an elevation of about 300m and found Crocus caspius again, flowering on the opposite hillside but, as we ascended further, nothing other than a few Anthemis and a Silene species appeared to be flowering. Hyrcanian forest above rice paddies. South of Sari, Iran, 17/11/2015. 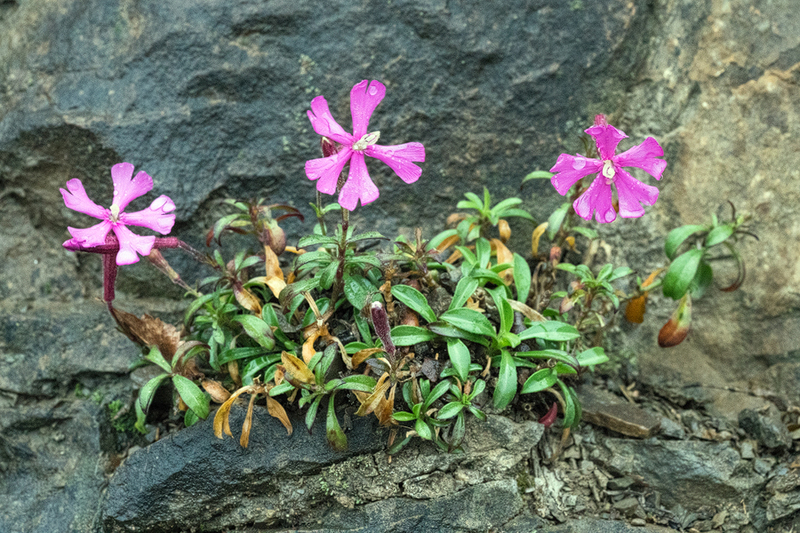 Silene sp. South of Sari, Iran, 17/11/2015. I had tried to come to Iran with as few prejudices as possible. Everyone I knew who had been positively raved about the place, but it was almost impossible to dispel completely images of a nation of flag-burning fanatics, foisted on everyone in the West by a media that thrives on sensation. Picture then the following scene, and ask yourself in which countries you have visited it could have taken place. You arrive, unannounced, at a manned checkpoint at the start of a dirt road leading up into a protected bit of forest. Explaining your mission to the guard, who is dressed in military fatigues, you are invited out of the cold into his cosy guard post and invited to use his stove to prepare your lunch and make tea. While this is happening, the guard shows you photographs on his mobile phone, of the changing scenery through the year and then sits with you while you eat, contributing his own lunch, a rather delicious mutton stew, to the feast. He leads you into the forest, proudly showing you a fabulous view over a river and points out fruiting shrubs of medlar and hawthorn, encouraging you to taste both (the medlar is delicious – sweet and slightly gritty, like a guava). As you take your leave, he shakes your hand as though you were an old friend and waves a cheerful goodbye. Call me naïve if you will, but I don’t think I’ve been anywhere else, except Georgia, where this kind of hospitality is absolutely normal. I know for a certain fact that an Iranian visitor to a British nature reserve could not expect to be treated with the same, simple, ingenuous grace. 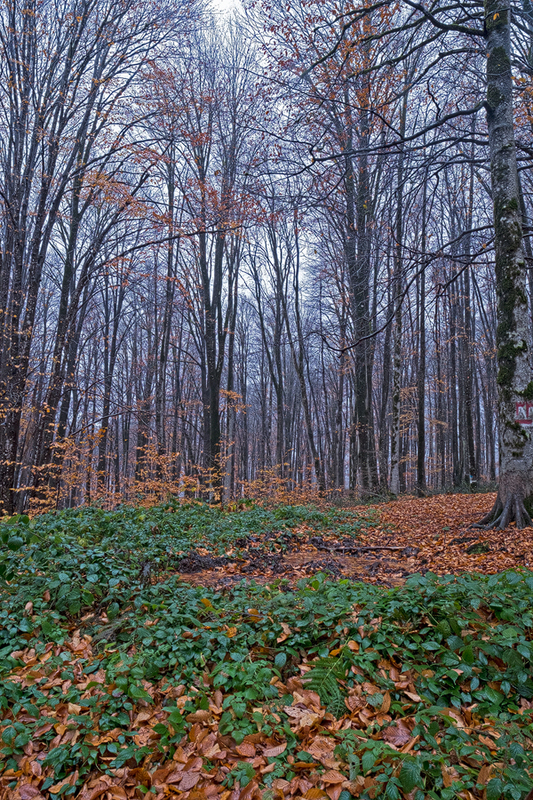 Beech woodland, Alborz Mountains, 18/11/2015. Crataegus sp. South of Sari, Iran, 19/11/2015. The beech forest was ravishingly lovely in the late afternoon mist. 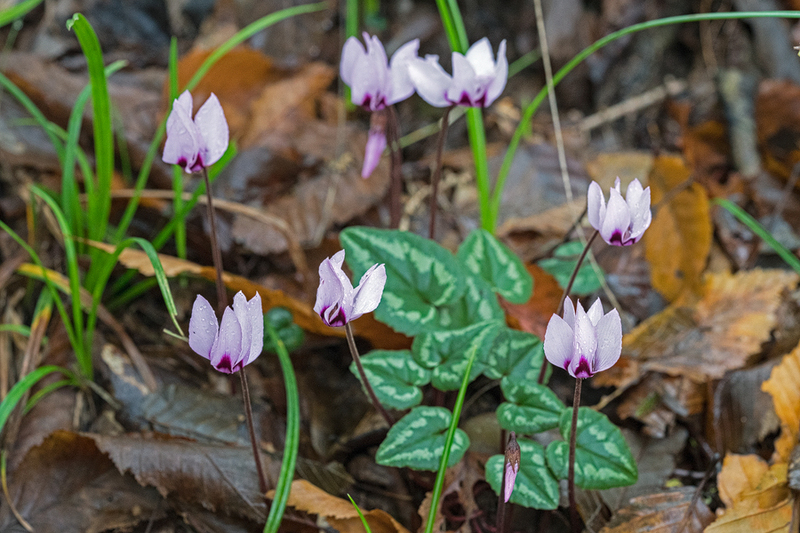 Cyclamen were again ubiquitous, but not flowering, on the forest floor. The commonest shrub in the understory was Ilex hyrcana (which may be synonymous with I. aquifolium but looks very different to my eyes), bearing clusters of red berries along its stems. We stopped at a place that Ismael knew and he led me up the slope to an outcropping of limestone boulders, over and around which grew a large colony of Danae racemosa, literally dripping with shiny red fruit. This superb evergreen shrub is endemic to these mountains by the Caspian and, though it is grown in large quantities for the floristry trade, is barely known in gardens. These plants seemed to have larger leaves than the examples I am familiar with from cultivation in the UK but perhaps this was an effect of the deep shade in which they were growing. Either way, I was wildly overexcited to have seen this plant in its natural habitat, and all my misgivings about our itinerary were forgotten. Danae racemosa, festooned with fruit, 1650m under beech. South of Sari, Iran, 18/11/2015. Edris also showed me the rhizomes of a completely dormant Polygonatum species, which had been exposed by rushing water at the edge of a stream. 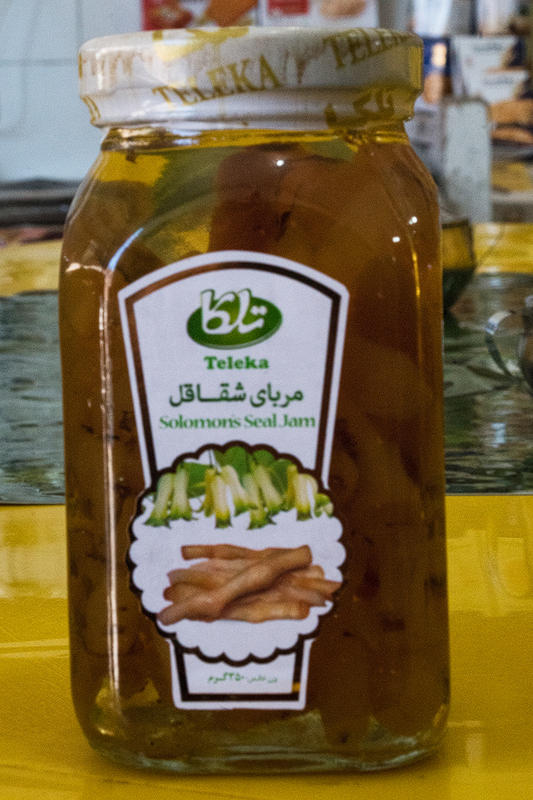 ‘Ah!’, said Nayer, bending down to look, ‘we use those to make jam, a very delicious jam.’ Later in the trip I bought a jar of it and discovered that it is indeed delicious, tasting like mild ginger, with a crunchy texture. Sadly, according to Ismael, Polygonatum is now threatened in the wild by over-collection for this purpose. Jam made from wild-collected Polygonatum. Someone should tell the clever chaps at CITES. Still higher, at an elevation of about 2,600m, we came to an area where the beech trees were as magnificent as any I have seen, ramrod straight, with trunks up to a metre in diameter and reaching 25 or 30 metres tall. Nothing but Ilex and brambles grew in the understory. Nayer had been busy on the phone, rearranging our accommodation, for the second night running – I am surely on a Tehran travel agency blacklist by now – and had organised a house in the nearest village, in which we were to spend the night. High elevation beech forest, Alborz Mountains, 18/11/2015. 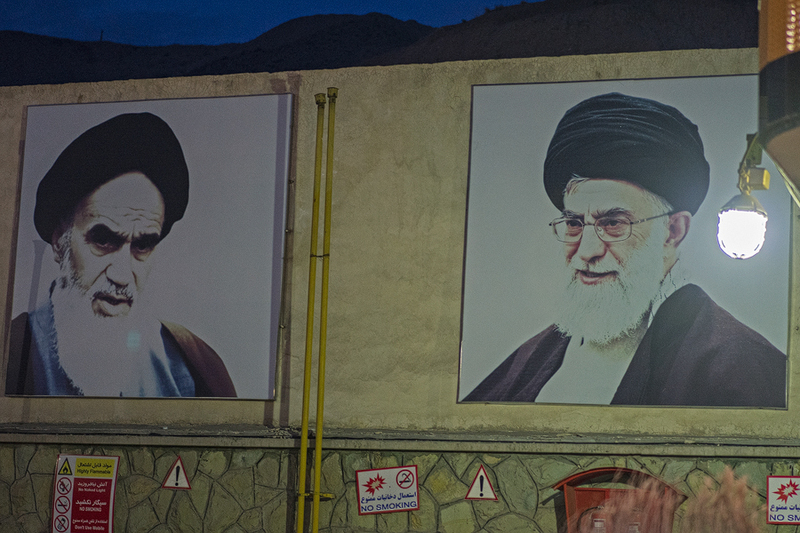 It is impossible to come to Iran without being drawn in to conversations about politics, religion and – in the aftermath of recent atrocities in Paris – Daesh, as the perpetrators of those attacks are contemptuously referred to in Iran. ‘You’ll be OK in Iran,’ various ‘experts’ had unnecessarily reassured me, with a worldly-wise wink. ‘Iranians are Shia Muslims and they hate the Sunnis, including ISIS.’ But this analysis is hilariously off-beam. Most of the Iranians I met were secular, cleaving to no god, and paying only the lightest of lip service to the State-imposed religion of Islam. I confess, a bona-fide atheist was not something I’d expected to meet in Iran, but they are there aplenty. Daesh is despised not because its members are notionally Sunni, but because they are savages. Iranians loathe terrorists for the same reasons all civilised people loathe terrorists. Spot the difference, a popular game at Iranian petrol stations. The more I travelled around Iran, freed from the need to drive and able to watch the world through my wide-open car window, and the more I talked and listened, the more the place started to remind me of somewhere else I’d travelled recently: the south-east of the USA. The parallels are uncanny. National flags and flattering portraits of political leaders – both of which would seem deeply embarrassing in Europe – are widely on display in both regions. It is almost impossible to get an alcoholic drink in either place, though slightly easier in the Islamic Republic (for the record, I abstained and developed a serious tea habit). The police are prominent and armed, though it is only in the USA that I have actually been approached by an officer with his gun drawn (I’d been pulled over for speeding, hardly a capital crime). Religious belief is deeply woven into the fabric of both societies but is largely confined to the poor and the ignorant, especially in Iran, and is exploited by the powerful, to manipulate the weak. A strong tradition of hospitality sits uneasily alongside a fundamental mistrust of strangers. In Iran, but not in the USA, the former easily wins out over the latter, even in the most rural places. That night, my head spinning with sweet tea and conversation, I was given a room to myself, so that my snoring would not keep everyone awake. Perhaps, I thought dozily, as I drifted off to sleep, we see the devil most clearly when we gaze into a cracked mirror. I slept blissfully through my second earthquake (the first was in Quito, or was it somewhere in Peru? a long time ago) and awoke to blue skies and the delicious prospect of a long drive back to Tehran. Morning, south of Sari, Iran, 19/11/2015. By dint of long and careful persuasion, I got Mostafa to drive us back towards the Caspian Sea, in the opposite direction to Tehran, hoping to photograph flowering Cyclamen and Crocus in better weather than we had so far enjoyed. 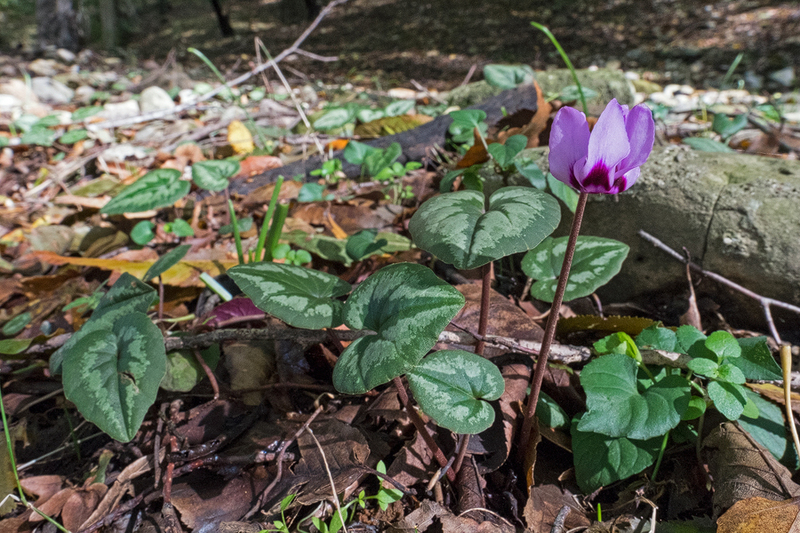 Cyclamen elegans, south of Sari, 19/11/2015. A silver-leafed form of Cyclamen elegans, south of Sari, Iran, 19/11/2015. Crocus caspius, south of Sari, Iran, 19/11/2015. 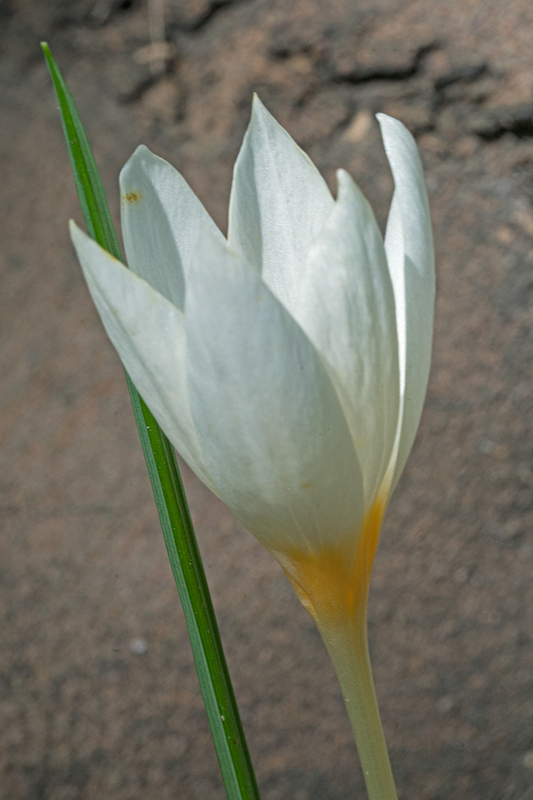 A white form of Crocus caspius, south of Sari, Iran, 19/11/2015. This objective achieved with surprising ease, we turned tail and headed south, taking the eastern road through the mountains. For part of its route, the road follows a railway line, which runs from Tehran to Sari, on the Caspian. Local legend has it that the last Shah’s father instructed the chief engineer to spend the night with his family under the most audacious bridge, a stunning architectural coup de théâtre, while the first trains rumbled across it. Where the train driver’s family spent the night is apparently not recorded. 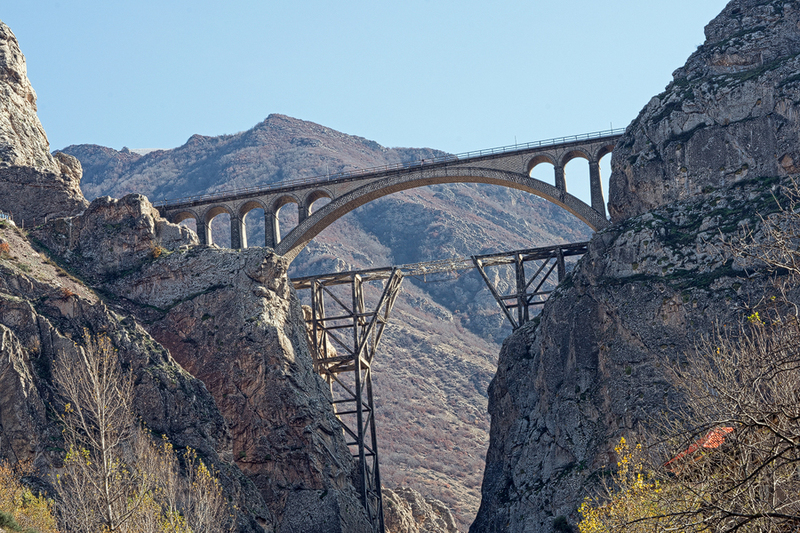 Audacious railway bridge, still carrying trains after 80 years. Eastern Alborz. We stopped for soup – delicious, slightly sour yoghurt, with onions and dried herbs – at the highest point on the road, and explored the surrounding hillsides for plants, finding nothing interesting except the twisted, glaucous leaves of a Muscari species. ‘Theeeeese plaaaace eeees peeeeenk weeeth Colchicuuuuuum, in spreeeeeng!’ said Mostafa, mournfully. I assured him, fervently, that I would return in spring but that I liked it very much, as it was. 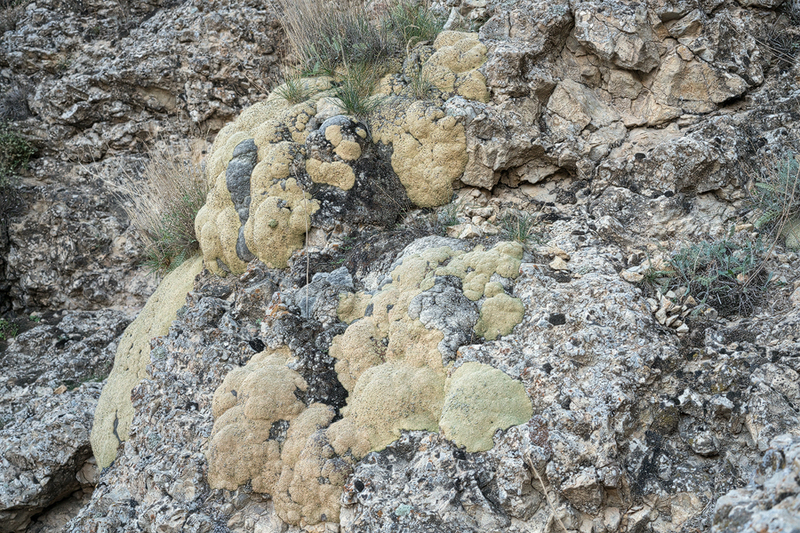 My time in Iran was nearly up and we had time only for one more detour, through a canyon, the walls of which were plastered with mounds of lichen-like Dionysia. The fertile, high elevation plains in this part of Iran are planted, as soon as the snow melts in spring, with wheat and there is enough water in the saturated soil to sustain the crop without further irrigation, until harvest a few, short months later. 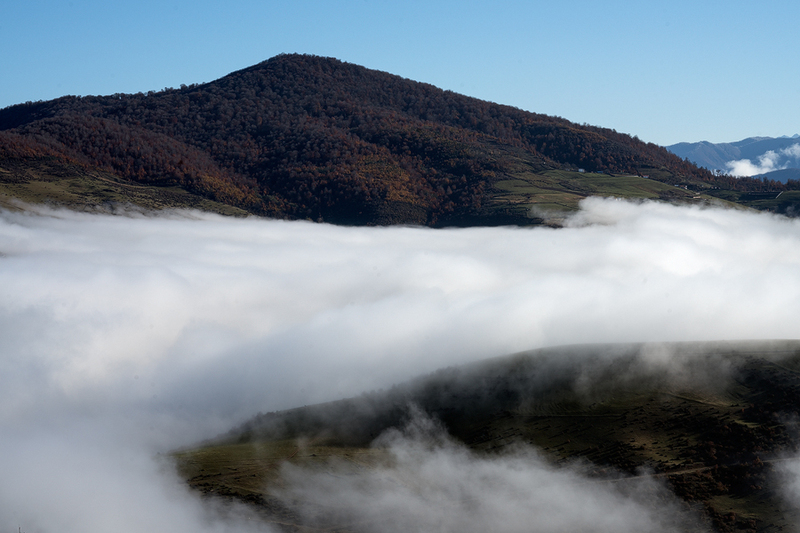 Eastern Alborz Mountains, Iran, 19/11/2015. Dionysia sp. 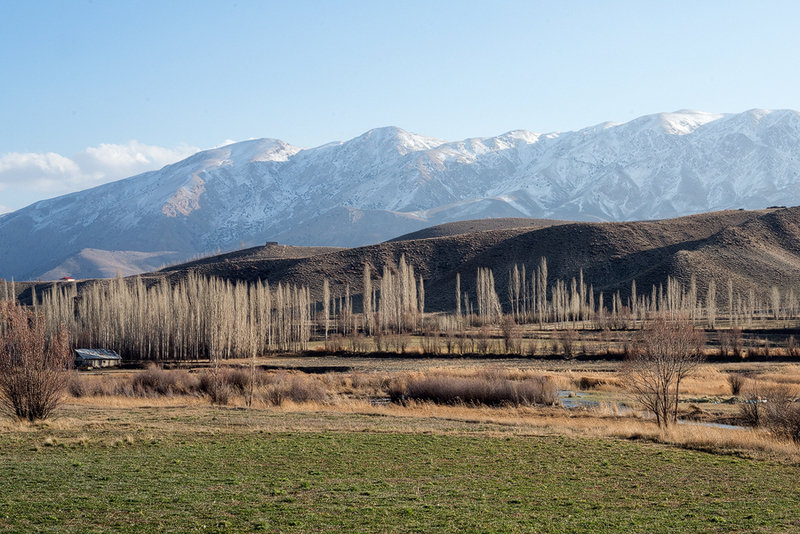 Eastern Alborz, 19/11/2015. So here we were, driving into the sunset towards Tehran, the snow-dusted mountains turning flesh-pink in the evening light. Mostafa, jauntily sporting a pair of horn-rimmed sunglasses borrowed from his wife and a black, woollen cap, drove doggedly onwards, rarely deigning to deploy any gear higher than second, making long, impassioned speeches in Farsi, every gesticulation causing the Nissan to swerve alarmingly across the highway. From the back seat a smell of burning percolated forwards. 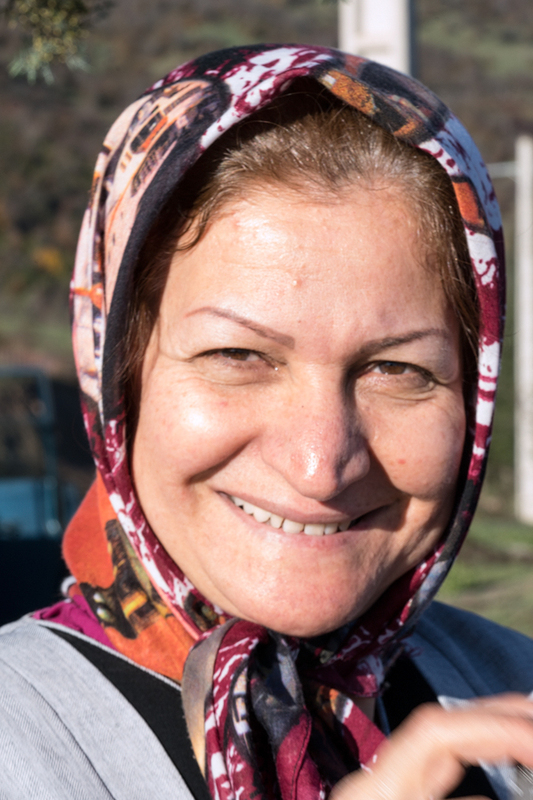 Nayer, while deftly returning her husband’s verbal forehands, was multi-tasking and attempting to set fire, in an aluminium billy can, to a handful of aromatic seeds that Ismael had gathered earlier at the roadside. Soon, despite the half-open windows, through which the chill desert air blew in a sinus-cleansing gale, the car was filled with an overpowering scent of incense, mingled with the sulphur from half a box of matches. Ismael was on the phone to an Afghani friend and lost in hysterical laughter. I sat in blissful silence, absorbing the musical rhythms of the Farsi language. It was like listening to an incoming tide on a pebbly beach, the pitch and volume rising and falling in a liquid susurration of incredible beauty. I let my mind slip into neutral, drinking in the passing landscape and reflecting that I had never, ever been happier. * This proves, to my complete satisfaction, that tea is fattening. I was shocked to find that this nonsense was not written by a 14 year old. Juvenile views and dreadful prose. Revolution Snowdrops is a blog about a quest to see and photograph all 21 species of Galanthus in flower, in their native habitats, in a single autumn and spring season. Follow my journey over the next seven months and share the adventures I plan to have.